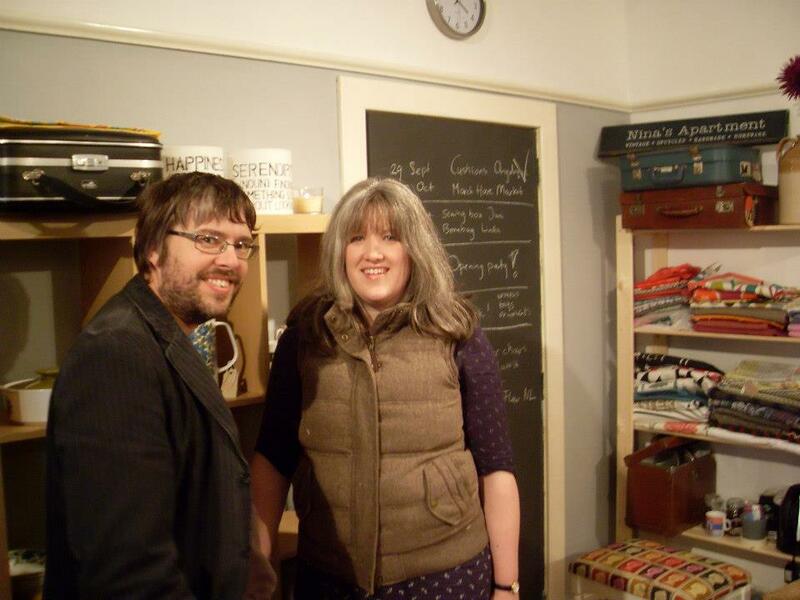 My vintage furniture shop in Inverurie, Aberdeenshire….is open! The Malpaso Gang playing in the woodworking shed! I love Scandinavian fabrics. The simplicity of the geometrical patterns and the strong colours have been used for decades but are still so timeless and work well in most interiors – contemporary or traditional. Marimekko is an obvious name in the ‘Scandi’ fabric design world, but I have recently discovered Lotta Jansdotter, who makes the most stunning prints and whose fabrics I have incorporated in many of my cushions. One day I might try and design my own Scandi-style fabrics, but for now I source beautiful material already available. Here are some cushions I have made recently using various Scandinavian fabrics. Sometimes things change quickly. Less than a year ago I set up my own business and started promoting my ventures online. In January I set up an Etsy account, in May I started selling at Yeadon’s bookshop in Elgin and I’ve done a number of craft/vintage fairs since last Christmas. It is August now and I have just got the keys to my very own studio & shop space. Eeek! What’s going on?! Am I scared? Yes, I am! It is out in the sticks and not on a busy high street, so I am going to have to shout loudly to draw attention! Nevertheless, it is hugely exciting and I will be part of a lovely old building housing other creative people who make furniture – and even complete handmade kitchens (the woodworking workshops there would make any joiner drool!). Oh yes, and it has lots of parking space (try to find that in a city!). It will be my own little work space where I can let my creative juices flow, paint, sew, design, make and also show off and sell my furniture, vintage, unique and handmade homeware and other nice things. I hope to make it a fun, inspiring and welcoming place to be, where people can come and spend some time, find inspiration, join me in creating things – or just catch up over a cup of coffee. But first things first: redecorating! An opening party will follow. Promise. Just a quick post to show you a before & after shot of a chair I’ve been doing up this weekend. It’s an original Ercol chair, probably a 1950s one. I have two, so once they’re both done they’ll make a great pair in someone’s kitchen! I painted them in Annie Sloan white chalk paint with on top a mix of the white with a bit of Farrow and Ball Old White through it. Distressed it with some fine sand paper at the end and put a clear wax coat on it. I always keep my eyes and ears open on the hunt for great vintage treasures. Last week I decided to randomly type in the words ‘bentwood chair’ in the search box of our local Gumtree and in the listings I found something that immediately caught my eye. I contacted the owner to arrange a viewing and in his back garden I found five battered, dirty, damaged chairs – but of an unmistakable design and the leftovers of the labels on the bottom made me smile from ear to ear: here I had no less than five original Hans Wegner wishbone chairs. He got them from a house-clearing somewhere, some time. I couldn’t believe my eyes – nor the price: £60 for the lot! They do need complete re-lacquering and seat replacement at some point, but for now I am the proud owner of a beautiful set of salvaged Danish designer classics. Looking good around our beech dining table! I added cushions…to prevent my cats from getting their claws into those vintage paper cord seats! Today I drove up to Elgin, north Scotland, with a car full of vintage and handmade goodies and got my very own ‘shop within a shop’! It’s fantastic to see my stock displayed inside a beautiful shop amongst thousands of books. Hopefully the customers will love Nina’s Apartment @ Yeadons of Elgin and help it to become a well known place not just for quality books and stationary, but for quality, eclectic homeware too. I will regularly update the stock with vintage and retro crockery and stoneware, fabrics and linens, suitcases, furniture and of course my own cushion designs. Please pay this wonderful bookshop a visit if you ever happen to be in the area. I am so excited, I think it deserves a big High Five! Yeehaa! I am so excited to share this news with you all… Not just a little bit… but UBER excited! I will be partnering up very soon with one of the best booksellers in the UK; Yeadons Booksellers in Elgin, north Scotland. This shop, one of the oldest continuously trading bookshops in Scotland – already established in 1887 – will be the perfect environment for my eclectic mix of vintage, handmade and upcycled homeware. It is a beautiful 1930s building, tastefully decorated with custom made shelving and vintage furniture and stocked with a carefully chosen, eclectic selection of books. Recently Yeadons started selling vintage homeware alongside their books, which went down a treat with the customers, complimenting the great mix of books and stationary and the friendly shopping atmosphere. 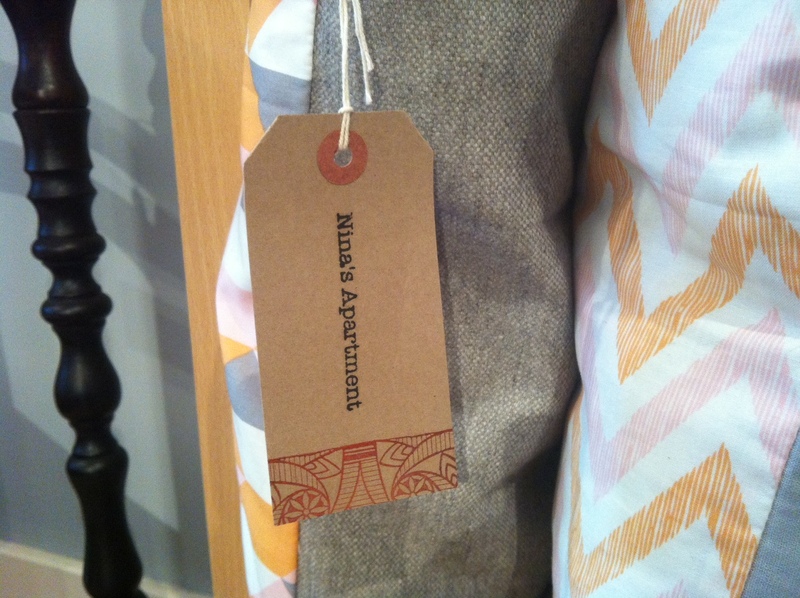 From next month Nina’s Apartment will be ‘moving in’ with them adding to the selection of wares with vintage treasures, handmade cushions and revamped furniture. I can’t wait! It felt like I was finally officially launching my business in ‘real life’ yesterday, at the Christmas Fair in Inchmarlo. I had my table all set up, my products displayed, my labels and packaging organised…how exciting! It’s all very well running an online shop and blog from behind the safety of your computer screen, but physically speaking to customers and seeing what they pick up, look at, like and buy (or don’t!) really is a different ball game…and so useful! I learned a lot in three hours. I am however pleased to say that my lovingly hand crafted patchwork cushions went down very well and so did my Christmas decorations and vintage items. I’ll definitely do more fairs next year! Here’s me, proud owner of my stall! I am proud to finally present to you the result of my £20 wardrobe makeover! Got it months ago from Banchory’s Box Room (great for finding old furniture) and I eventually painted it and did it up. I love the combination of the blue and the brass hinges. It is now baby’s first antique piece – holding all its baby grows, cute little cardigans and mini socks. I painted the inside of the wardrobe in Annie Sloan‘s duck egg blue chalk paint and the outside in her Aubusson blue shade (with a layer of duck egg blue underneath which shines through after I lightly sanded through the corners and edges). I also stuck some blue-green retro fabric against the inside back panel of the wardrobe. My sister, who has been helping me finish the nursery over the past few days, put in an extra shelf (which she made out of our old bed slats!) and we got some useful storage boxes for underneath. She also saved me some money by suggesting using an old broom stick as a clothes rail and painting it in the same colour as the wardobe. Neat! The broom stick clothes rail and bed slat shelf!